Gracing the “Vintage Flats”, Colonial revivals are found along “B”, “D”, “I”, and 6th streets. 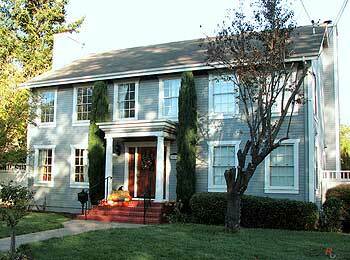 Although a “Nostalgic” style, many of Petaluma’s Colonial homes are actually of recent construction. Take a stroll down B street to see some of the most fantastic examples. In its early phase (1880-1915) the Colonial Revival tended to involve grandiose structures that incorporated designs characteristic of the original Colonial style: Palladian windows, gambrel roofs, pedimented porticos, columns, classical detailing such as swags and urns and crisp, white trim. While these larger homes showed more restraint than did the showier Chateauesque and Romanesque styles, they were rarely historically correct copies. It wasn't until later, between 1915 and 1935, that Colonial Revival fashion shifted toward a truer facsimile of the Colonial prototype. In the 1940s and '50s, a further simplification was made (largely due to the depression and changing postwar fashions), and Colonial Revivals were built that only suggested, rather than replicated, their Colonial predecessors. 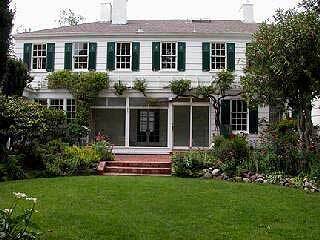 The Colonial Revival style began after the American Centennial in 1876. It was then that the public developed a new fascination with their Colonial roots. The anti-England sentiment that had spawned the Greek Revival had largely abated, and American expatriates found themselves suddenly hungering for their homeland. By the 1890s, architects could not build houses that fed that nostalgic fervor fast enough, and the Colonial Revival became a staple of American domestic design. It continues in all its various forms and deviations to this day.